I love Brazilian coffee. There’s obviously the taste, strong but not bitter and incredibly sweet, but it’s the serving of Brazilian coffee makes me smile: in minuscule cups. I appreciate something small and excellent, like Meu Doce Pará cookies that are smaller than the tip of my pink. So it is with Brazilian coffee. 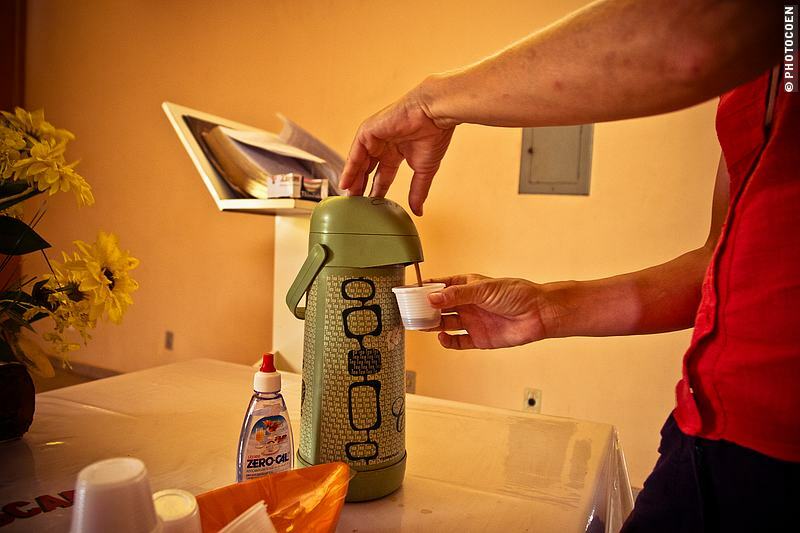 The first time we were served coffee in Brazil, we were looking at our cups with some surprise. We had never seen such tiny plastic cups, about two inches high. I will admit, the taste is not for everyone as Brazilian coffee is generally served incredibly sweet. 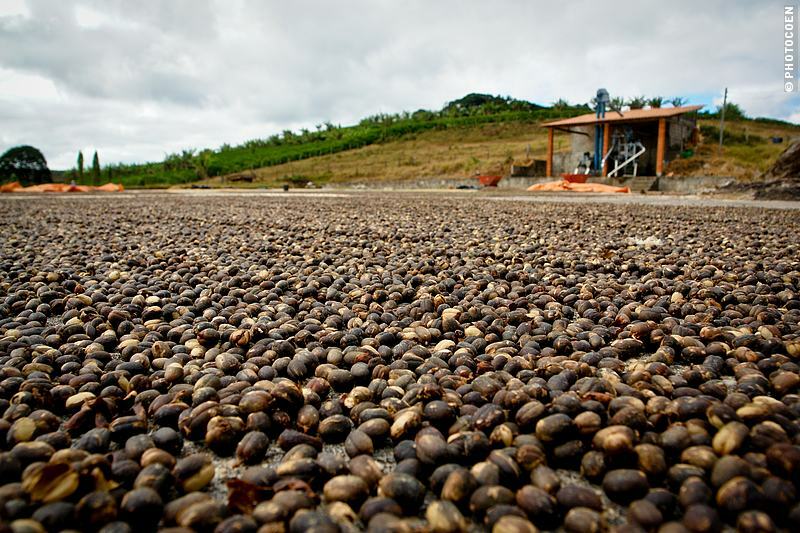 However, things are changing in Brazil, even when it comes to something as traditional as super-sweet coffee. When we traveled here for the first time, in 2007, coffee was always sweetened. Nowadays, you can often choose between a sweetened version and an unsweetened version to which you can add as little or as much sugar as you want, or adocante (artificial sweetener), which is becoming increasingly popular here. Brazil is unique in her coffee culture. It starts with the word: In this country you don’t drink café. Here you drink a cafezinho: a small coffee. The cafezinho obviously fits the size of the typical plastic cup in which it’s served, which I have seen nowhere else. Some places (homes, for example) they use china, but in public places plastic is still the norm (very unfortunate for the environment). In Brazil the preparation of coffee is different from anywhere else (as far as I’ve seen). 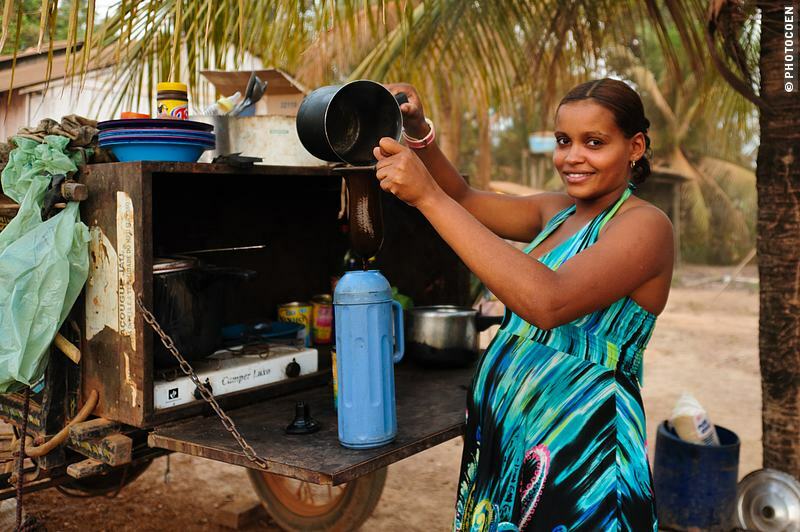 Brazilians boil water, add coffee, stir quite a long time and (traditionally) add lots of sugar. This goes entirely against the official coffee-making rule according to which the water for a good cup of coffee should be 90 degrees, maximum. In Brazil, coffee is boiled. When the taste is right, the coffee is poured through a cotton coffee sock although, via the media, the government is trying to get people to use plastic filter holders with disposable paper filters (for hygienic reasons). At gas stations there is always a thermos of coffee available, which sometimes stands next to the cashier. You may also walk inside the restaurant and just ask at the counter for a cafezinho, which is free of charge. Free cafezinho is also served in ordinary restaurants where you eat a prato feito (fixed meal) or from a pay-per-kilo buffet (by contrast, in luxurious restaurants coffee is served in china and is added to your bill). By the way, another interesting feature in many restaurants, depending on the region, is the presence of a bible. The serving tray with thermos, sugar and plastic cups often stands next to it. I like this hospitable culture where coffee is offered free of charge. It is a small gesture that makes me smile. It’s not about not being able to afford a cup of coffee; it’s the gesture, the culture, the tradition. The first time I wanted to pay for a cafezinho at a gas station, as yet unaware it was free of charge, the woman behind the counter looked at me shocked. “No, this is our way of showing hospitality,” she immediately stated, which left no doubt that the issue is almost one of honor. The boiling of water, the adding of coffee and sugar and stirring is a process that takes time. It’s done with dedication and does not allow distraction. If you happen to be the unlucky one to find the thermos empty, the restaurant/gas station owner will most likely say, “I’ll make a new one. No problem. Rapidinho!” (“very fast”, never mind that it may take twenty minutes or longer; in Brazil lots of things are done rapidinho in this way). But What if There’s No Gas Station or Restaurant? I bought a filter, a small thermos and by trial and error learned to make a reasonable Brazilian coffee (I still can’t beat the one made by locals, there must be a secret touch somewhere). Before leaving Brazil to go to Bolivia in 2010, I bought ten packages of Brazilian coffee wit and when going to the Guianas a year later, I doubled that number. No way am I going to run short anymore. Even the generally much-appreciated Dutch coffee of Douwe Egberts which is widely available in Suriname doesn’t come close. There was one thing missing in my system though: the right cups. We have these big thermos cups from which we drink tea, Nescafe, wine, yogurt, coffee, beer, caipirinha (that just about covers it, I think). Drinking Brazilian coffee from such a big cup feels like an insult. Brazilian coffee is not meant to be drunk in large quantities and deserves a properly sized cup. So, when I was in the Netherlands, I set myself a shopping mission. China obviously won’t last long in the Land Cruiser but I had seen – at one point in time – stainless steel espresso cups. Apparently, that fashion had long passed; now that I needed them I couldn’t find them. Bless my mother-in-law. She had two. And I could have them. Every morning, after our breakfast ritual that still comes with tea and toast, I have my second ritual: preparing my Brazilian coffee, which is now drunk from lovely tiny stainless steel cups. It’s a perfect way to start the day and still is one of these small joys in my life. Edited to add Jan ’15: the cups stayed, but the way we prepare our coffee has changed. Want to know how? Here you can read all about it. Cooking Food for 7 Days? How Slow can Food Be? This entry was posted in Brazil Travel, Food by Karin-Marijke Vis. Bookmark the permalink. Glad you liked the coffee from Brazil. I’ll try to give some advice for you to make a good coffee! 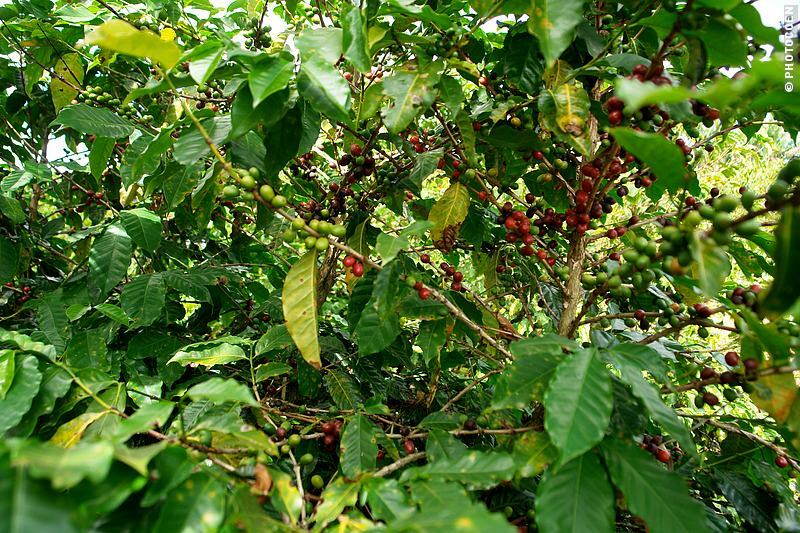 Always seek Arabica coffee beans, which are produced in mountain regions and far away from the sea. Iodine that exists in the maritime air spoils the coffee. 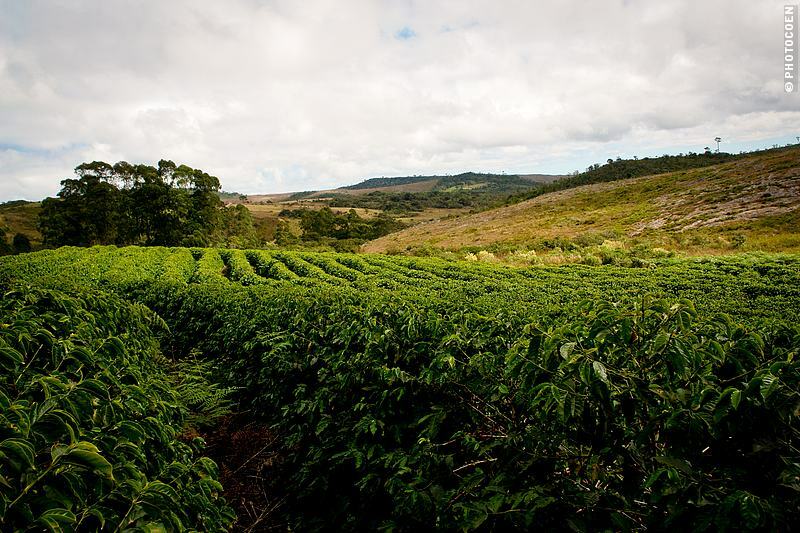 The best coffee in Brazil, are planted in Minas Gerais. In the preparation you can use 20 grams of powder to 100 ml of water. Boiling water is a mistake, for good coffee. Pour hot water (90 Celsius) over coffee and do not stir. Hope this helps. There is no secret to prepare a good Brazilian coffee. I can not write in English language and use Google Translate. His trip is wonderful and always accompany their reports. I wish health, luck, peace and long life. I know that for many people it is unusual to see coffee being prepared in that TRADITIONAL way. However, that is the original, ancient way of preparing the best coffee you can taste. In Turkey, Greece, Romania, Bulgaria, Serbia, (Balcan states in general) the whole Middle East, Gulf states and Ethiopia (probably the ground zero for coffee) coffee is being boiled. Some bring it to a boil, spoon the froth on top and divided between cups, then, immediately bring it to boil once more, then let it settle, so that sediments go to the bottom and serve. Sugar is added from the beginning indeed, so it can dissolve properly. It is very important that coffee is not very high roast, as in an espresso coffee, AND is EXTRA FINE ground, almost like flour! The 90 degrees rule is for espresso/coffee machines, different thing entirely. Do it the traditional way anytime you have the time, and ENJOY!